Designed for the ultimate Transatlantic Crossing experience, the 2,600-guest Queen Mary 2 is the world's only true ocean liner, which will also take you to worldwide destinations in high-end splendor. Cunard Line's elegant flagship boasts a vast art collection, haute cuisine, lavish theme balls and the only planetarium at sea. Experience Cunard's legendary White Star Service™ from the moment you embark and marvel when you enter the Grand Lobby. 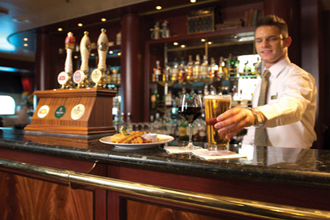 You will know why discerning travelers return to Queen Mary 2 time and again. 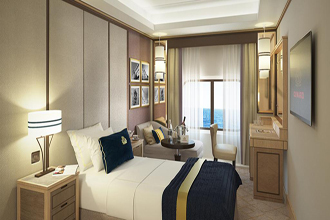 The luxury ship was remastered in June 2016 with new contemporary interior designs that were inspired by the original Queen Mary, a symbol of British elegance. 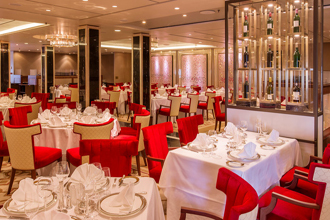 Elegant suites and staterooms, re-imagined Grills experiences and sumptuous new restaurants make Queen Mary 2 more exciting than ever. New features include the stunning Carinthia Lounge, with a self-service café and The Verandah restaurant serving world-class French cuisine. Kings Court was transformed into a central buffet area with new menus and pre-set tables. 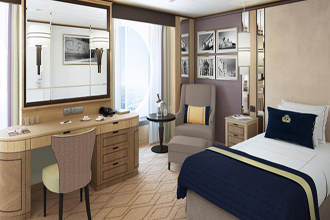 Part of the redesign also included updating the Queen Grill and Princess Grill Suites and restaurants, Britannia staterooms, the addition of 30 Britannia Club staterooms and the introduction of 15 Britannia single staterooms. 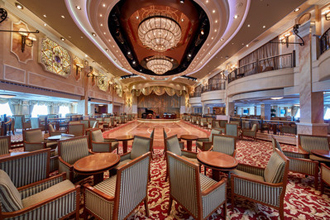 Choose from endless possibilities everyday on board the grand Queen Mary 2, with the largest dance floor at sea in the regal Queens Room, the setting for formal balls. Illuminations combines a 3D cinema, a classical music venue and the Planetarium, featuring incredible daily shows. 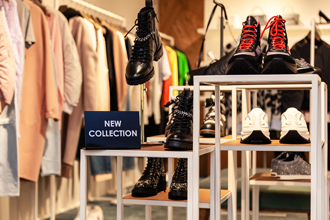 High-end boutiques and names such as Harrods, Barbour and Aspinal of London can be found at the Mayfair Shops. 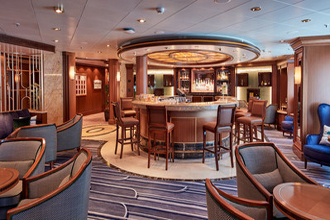 Chic and elegant bars, the largest library at sea, swimming pools and a computer center are just some of the many amenities for you to enjoy at your leisure. Pamper yourself at the expansive and beautifully appointed Canyon Ranch SpaClub® that offers the best rejuvenating treatments and personalized fitness training wherever you are in the world. Enjoy a pre- and post-dinner drink at the elegant Chart Room while listening to jazz and bid at an art auction. 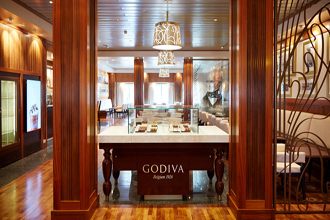 Sip champagne from a Waterford crystal flute at the chic Veuve Clicquot Champagne Bar and enjoy your favorite red or white at Sir Samuel's Wine Bar, which now boasts the Godiva Chocolate Café. 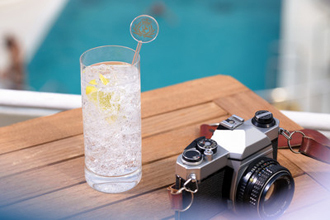 Watch the sunset from the Commodore Club martini bar, where specially crafted cocktails were introduced in 2016. Join in the karaoke and games at the English pub called the Golden Lion. Enriching lectures and workshops offered by "Cunard Insights" with notables from a variety of fields. Sports facilities include a basketball court and one for paddle tennis, as well as golf simulators. 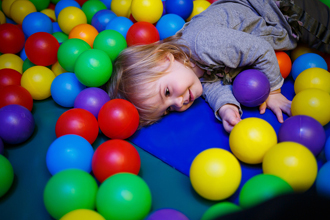 Fun programs for children aged two to 17 are offered and clubs include the Play Zone, Kid Zone and Teen Zone. 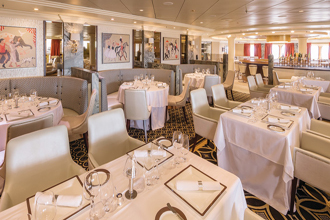 Savor world-class international cuisine at a myriad of unique venues on Queen Mary 2. 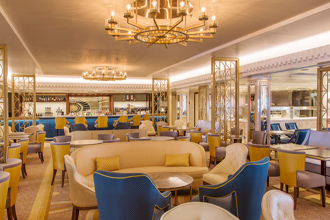 Discerning travelers will be delighted as they enjoy some of the finest dining at sea, including the ship's new specialty restaurant, The Verandah, serving exquisite French dishes and the beautiful two-level Britannia Restaurant, Queens or Princess Grill. Casual buffets are served at the newly designed Kings Court with such evening cuisines as Indian, Italian Pan Asian and Tex Mex. Feel like royalty was you enjoy a traditional Afternoon Tea accompanied by the music of an orchestra. 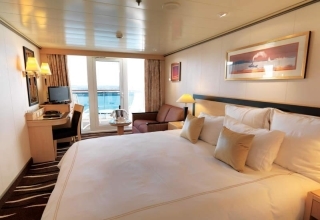 New single staterooms have been added for guests traveling solo, in addition to stunning accommodations include exquisite two-deck-high duplex apartments. For the ultimate luxury, they can be connected to a penthouse, for an incredible huge living area. Also featured, are the deluxe penthouses, penthouses, suites, deluxe cabins and standard cabins, all with fabulous amenities and offering a retreat. World-class entertainment includes extravagant Royal Night Theme Balls at the elegant Queens Room, the largest ballroom at sea and kick up your heels at the disco. Broadway-like productions are featured at the two-level Royal Court Theatre. Reach for the stars at the incredible the planetarium and enjoy conversation at the intimate bars. Set sail on Cunard Line's legendary Queen Mary 2 for a unique journey that will delight first-time cruisers and discerning travelers alike in unsurpassed elegance. Cruise on the Queen Mary 2 to worldwide destinations. 2 beds, shower, living area and balcony (approx 248 sq. ft). 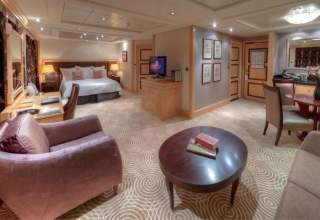 Your Britannia Club Balcony stateroom provides an ideal retreat of comfort and good taste. Enjoy the luxury of your own private balcony and choose a la carte specialities as you dine in the intimate single-seating Britannia Club restaurant. The diagrams and pictures of staterooms shown are examples only, and individual staterooms may vary. 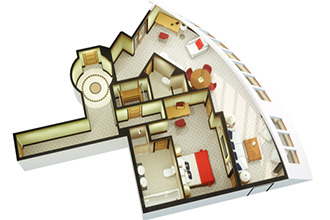 2 beds, shower, living area and balcony (between 239 - 248 sq. ft). 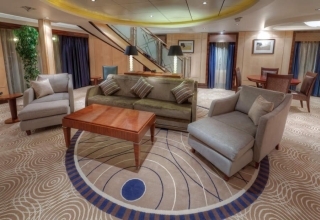 Your Britannia Club Balcony stateroom provides an ideal retreat of comfort and good taste. Enjoy the luxury of your own private balcony and choose a la carte specialities as you dine in the intimate single-seating Britannia Club restaurant. The diagrams and pictures of staterooms shown are examples only, and individual staterooms may vary. 2 beds, shower, living area and balcony (approx 248 sq. ft). At any time of day your luxury stateroom provides a welcome enclave of comfort and good taste. Enjoy the view as you watch the world go by from your own private balcony. Guests dine at a reserved table for either early or late dining in the Britannia restaurant. This stateroom grade has a balcony. The diagrams and pictures of staterooms shown are examples only, and individual staterooms may vary. 2 beds, shower, living area and balcony (approx 269 sq. ft). At any time of day your luxury stateroom provides a welcome enclave of comfort and good taste. Enjoy the view as you watch the world go by from your own private balcony. Guests dine at a reserved table for either early or late dining in the Britannia restaurant. This stateroom grade has a sheltered balcony. 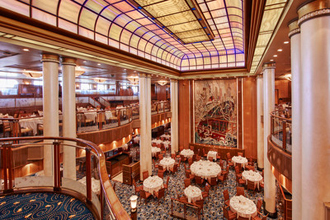 The diagrams and pictures of staterooms shown are examples only, and individual staterooms may vary. 2 beds, shower, living area and balcony (approx 248 sq. ft). 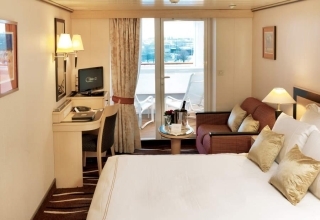 At any time of day your luxury stateroom provides a welcome enclave of comfort and good taste. Enjoy the view as you watch the world go by from your own private balcony. Guests dine at a reserved table for either early or late dining in the Britannia restaurant. This stateroom grade has views obstructed by lifeboats. The diagrams and pictures of staterooms shown are examples only, and individual staterooms may vary. 2 beds, shower and living area (approx 159 sq. ft). 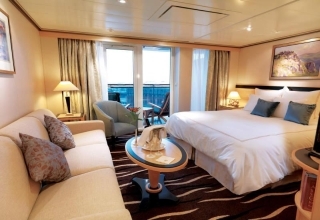 At any time of day your luxury stateroom provides a welcome enclave of comfort and good taste. Our turndown service sets the tone for a comfortable night’s sleep. Guests dine at a reserved table for either early or late dining in the Britannia restaurant. The diagrams and pictures of staterooms shown are examples only, and individual staterooms may vary. 2 beds and shower (approx 159 sq. ft). 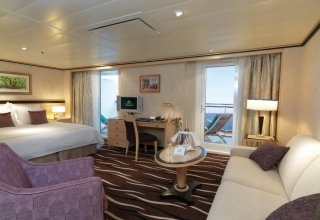 Our standard staterooms are anything but ordinary. The smallest is more like a “deluxe” on any other cruise ship. Guests dine in the Britannia restaurant with a choice of early or late sitting. The diagrams and pictures of staterooms shown are examples only, and individual staterooms may vary. 1 beds and shower(approx 183 sq. ft). At any time of the day your luxury single stateroom provides a welcome enclave of comfort and good taste. Wrap yourself in the soft bathrobe, ease into your slippers, then settle down to a film on your TV. Our turndown service sets the tone for a comfortable night's sleep. Guests dine at a reserved table for either early or late dining in the Britannia Restaurant. 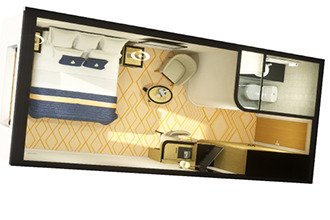 The diagrams and pictures of staterooms shown are examples only, and individual staterooms may vary. 1 beds and shower (approx 178 sq. ft). At any time of the day your luxury single stateroom provides a welcome enclave of comfort and good taste. Wrap yourself in the soft bathrobe, ease into your slippers, then settle down to a film on your TV. Our turndown service sets the tone for a comfortable night's sleep. Guests dine at a reserved table for either early or late dining in the Britannia Restaurant. 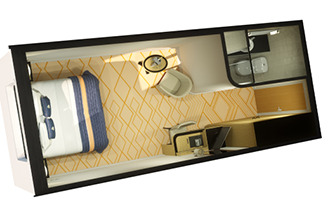 The diagrams and pictures of staterooms shown are examples only, and individual staterooms may vary. 2 beds, bath with shower, living area, balcony(approx 381 sq. ft). The luxury Princess Grill Suites offer elegant comfort and personal service. 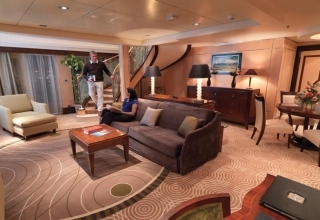 Guests enjoy access to private lounges and our Grills Concierge will make arrangements you wish both on board and ashore. Dine at a reserved table in the single-seating Princess Grill restaurant. The diagrams and pictures of staterooms shown are examples only, and individual staterooms may vary. Upper level - bedroom, 2 master bathrooms, Lower level - guest bathroom, living/dining areas, balcony (approx 2,249 sq. ft). Indulge in the most luxurious interpretation of the Cunard experience as you reside in a choice of lavish suites, all with separate living and sleeping areas, a private balcony on which to unwind, plus a host of delightful flourishes. 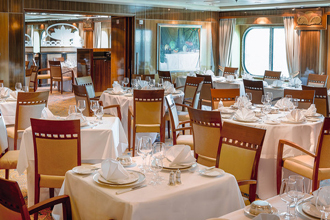 Exquisite à la carte menus invite your perusal in the exceptional Queens Grill dining room each evening.The diagrams and pictures of staterooms shown are examples only, and individual staterooms may vary. Upper level - bedroom, 2 master bathrooms, Lower level - guest bathroom, living/dining areas, balcony (approx 2,249 sq. ft). Indulge in the most luxurious interpretation of the Cunard experience as you reside in a choice of lavish suites, all with separate living and sleeping areas, a private balcony on which to unwind, plus a host of delightful flourishes. 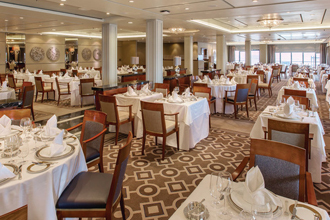 Exquisite a la carte menus invite your perusal in the exceptional Queens Grill dining room each evening.The diagrams and pictures of staterooms shown are examples only, and individual staterooms may vary. Suites 10.004 and 10.003 are single level suites. 2 beds, bath and shower, guest bathroom, living/dining areas(approx 796 sq. ft). Indulge in the most luxurious interpretation of the Cunard experience as you reside in a choice of lavish suites, all with separate living and sleeping areas, plus a host of delightful flourishes. Exquisite à la carte menus invite your perusal in the exceptional Queens Grill dining room each evening. The diagrams and pictures of staterooms shown are examples only, and individual staterooms may vary. 2 beds, bath and shower, guest bathroom, living/dining areas, balcony(approx 758 sq. ft). Indulge in the most luxurious interpretation of the Cunard experience as you reside in a choice of lavish suites, all with separate living and sleeping areas, a private balcony on which to unwind, plus a host of delightful flourishes. Exquisite à la carte menus invite your perusal in the exceptional Queens Grill dining room each evening. The diagrams and pictures of staterooms shown are examples only, and individual staterooms may vary. 2 beds, bath with shower, living area, balcony(approx 506 sq. ft). Indulge in the most luxurious interpretation of the Cunard experience as you reside in a choice of lavish suites, a private balcony on which to unwind, plus a host of delightful flourishes. Exquisite à la carte menus invite your perusal in the exceptional Queens Grill dining room each evening. 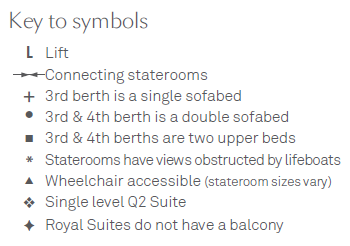 The diagrams and pictures of staterooms shown are examples only, and individual staterooms may vary. 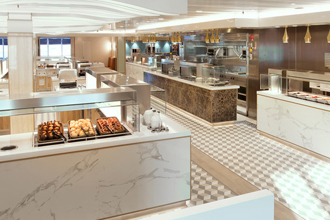 The highest outdoor area on Queen Mary 2 , exclusively for Grills guests to soak up the sun and admire the scenery. The Verandah restaurant offers contemporary French cuisine that makes use of seasonal ingredients of real provenance. Designed to create a genuine dining experience, The Verandah takes design inspiration from the original Verandah Grill on board Queen Mary. World renowned speakers offer informative talks as part of our Insights Programme, meanwhile RADA graduates will teach you the art of the stage in informative workshops. The Teen Zone is a programme for 13 to 17 year olds on board. Activities include deck sports, discos, gaming consoles, quizzes and more. The exact age groupings for older children will depend on the number of children travelling on any particular cruise. Our shops offer stunning jewellery, fashion and the latest fragrances, not to mention Cunard gifts. 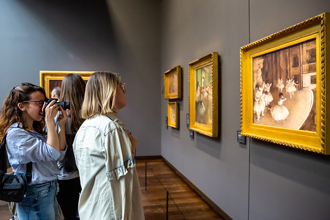 Additionally the gallery on board presents some of the world’s best artists’ works for viewing and sale. 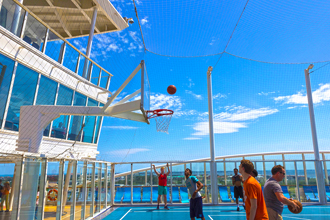 There’s so much to do on board. 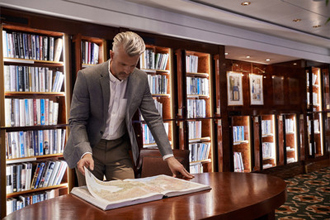 From Afternoon Tea to the largest library at sea. Or spend your time relaxing in the large spa, complete with treatment rooms, saunas and pool. 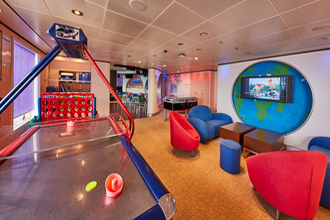 The Play Zone on board QM2 is a continuously supervised area for children aged from 2 to 7 years old (infants from 6 months to 23 months old are welcome to come and participate with parental supervision). 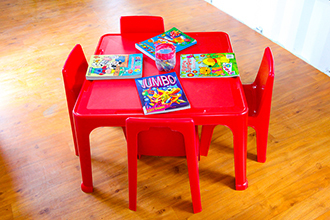 Activities include themed days, arts and crafts, a range of toys, computer games and more. Cunard’s signature Commodore Club majestically overlooks the bow of Queen Mary 2 and provides glorious panoramic views as you sail towards the horizon. An extensive selection of Martinis are available and you may even be tempted to try our Martini Mixology or Whisky Tasting classes. A tranquil retreat by day, the serene Carinthia Lounge provides the perfect place to relax and catch up with friends, or a good book, as well as enjoy light breakfast and lunch dishes along with premium teas and coffee and handmade patisseries. When the sun sets, the atmosphere evolves into an inviting evening spot where carefully selected wines are paired with tasting plates, and relaxed entertainment. Order your favourite cocktail from the Chart Room's fabulous drinks menu as you begin your evening on board Queen Mary 2.